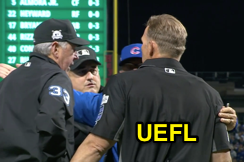 RF Umpire Mike Winters ejected Cubs Manager Joe Maddon (foul ball call by HP Umpire Jim Wolf; QOCN) in the top of the 8th inning of the Dodgers-Cubs game. With one out and one on (R1), Dodgers batter Curtis Granderson attempted to strike a 2-2 knuckle-curve from Cubs pitcher Wade Davis, originally ruled a swinging strike by HP Umpire Wolf and reversed to that of a foul ball after consultation with 3B Umpire Eric Cooper and crewmates. Replays indicate Granderson's bat did not make contact with the baseball during the pitch in question, the call was incorrect. At the time of the ejection, the Cubs were leading, 3-2. The Cubs ultimately won the contest, 3-2. This is Mike Winters (33)'s third ejection of 2017, second of the 2017 postseason, 2nd of the NLCS. Mike Winters now has 6 points in the UEFL Standings (6 Prev + 2 MLB - 2 Incorrect-Crewmate = 6). Crew Chief Mike Winters now has 8 points in Crew Division (8 Previous + 0 Incorrect Call = 8). This is the 187th ejection report of 2017, 3rd of the postseason. This is the 89th Manager ejection of 2017. This is Chicago-NL's 7th ejection of 2017, 1st in the NL Central (CHC 7; CIN, MIL, PIT 6; STL 4). This is Joe Maddon's 4th ejection of 2017, 1st since October 14 (Mike Winters; QOC = Y-C [Replay]). This is Mike Winters' 3rd ejection of 2017, 1st since October 14 (Joe Maddon; QOC = Y-C [Replay Review]).